Calendar of Treasury Books, Volume 23, 1709. Originally published by His Majesty's Stationery Office, London, 1949. Uchdulas, co. Denbigh, commote of, 184, 240. Uchorvey, co. Carnarvon, commote of, 240. Ulster King at Arms. See IrelandArms, Officers at. Ulster, Province of, barracks in, maintenance of, 120. Uniack, James, lieutenant in Brigadier Cunningham's regiment of dragoons, half pay for, 121. Union between England and Scotland, 7, 34, 54, 55, 59, 60, 61, 72, 74, 75, 77, 83, 94, 171, 174, 175, 183, 195, 208, 230, 258, 414, 439, 487.
individual losses by, 76, 83, 105, 163, 264, 291. Unonius, Peter, master of the Unity, 482. Unthank, John, appointed Customs boatman at Sunderland, 41. Uphill, co. Somerset, Customs boatman at, 467. Upland Pond Wood, co. Kent, 422. Upper Cross Common. See St. Christopher. Upton, Hudson, Deputy Comptroller of Falmouth port, 467. -, Richard, waiter and searcher of Falmouth port, 467. Urmston (Whinston), John, chaplain for North Carolina, passage money for, 328, 345. Urquhart, John, one of the Masters of the Work in Scotland, salary, 267. Utkinton, co. Chester, mills of, 129. Valentine, Judith, annuity granted to, 312. Vale Royal, co. Chester, 129. 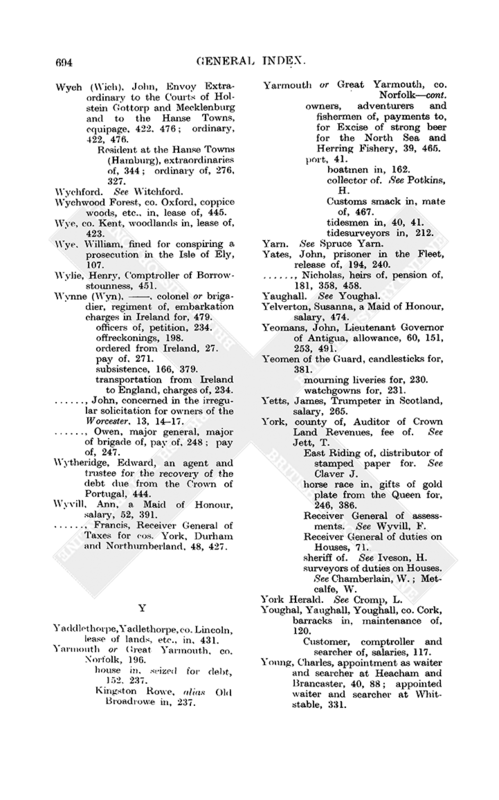 Vanbeck, , jeweller, payment to, 165. Vanbrugh (Vanburgh), Carlton, of London, merchant, 45. -, George, of London, merchant, permit to reduce brandy to proof, 392, 397. -, John, Clarencieux King-at-Arms, fee of, 281. Vandenbergh, Margaret, daughter of Nicholas, annuity during the life of, 96. -, Nicholas, of Delft, 96. Vanderheyden, , of Amsterdam, bills drawn by, 70, 228, 379. Vanhaesdonck, John, grantee of marsh and derelict lands in Norfolk, Suffolk, Flint and Chester, 3734. Vanhomrigh, [Bartholomew, Commissary General of Provisions for the Army in Ireland], accounts of, 307. Varner, Henry, captain, Army debenture of, 356. 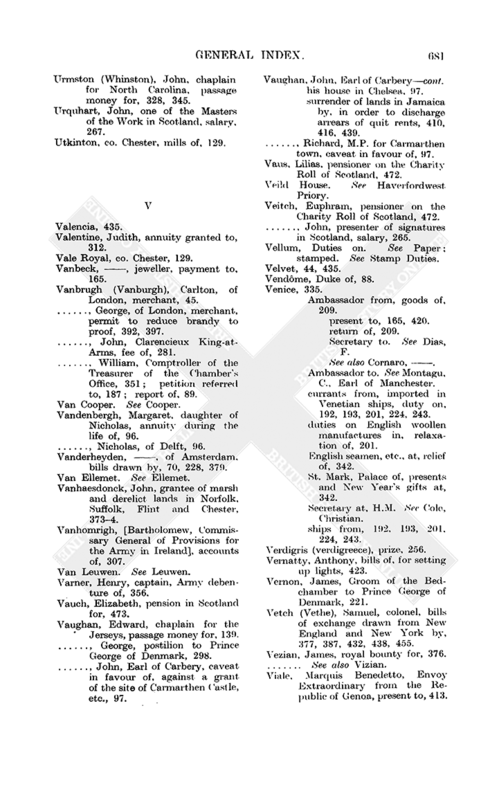 Vauch, Elizabeth, pension in Scotland for, 473. Vaughan, Edward, chaplain for the Jerseys, passage money for, 139. -, George, postilion to Prince George of Denmark, 298. -, John, Earl of Carbery, caveat in favour of, against a grant of the site of Carmarthen Castle, etc., 97.
his house in Chelsea, 97.
surrender of lands in Jamaica by, in order to discharge arrears of quit rents, 410, 416, 439. -, Richard, M.P. for Carmarthen town, caveat in favour of, 97. Vaus, Lilias, pensioner on the Charity Roll of Scotland, 472. Veild House. See Haverfordwest Priory. Veitch, Euphram, pensioner on the Charity Roll of Scotland, 472. -, John, presenter of signatures in Scotland, salary, 265. Ambassador from, goods of, 209. Secretary to. See Dias, F.
Ambassador to. See Montagu, C., Earl of Manchester. currants from, imported in Venetian ships, duty on, 192, 193, 201, 224, 243.
duties on English woollen manufactures in, relaxation of, 201. English seamen, etc., at, relief of, 342. St. Mark, Palace of, presents and New Year's gifts at, 342. Secretary at, H.M. See Cole, Christian. ships from, 192, 193, 201, 224, 243. Vernatty, Anthony, bills of, for setting up lights, 423. Vernon, James, Groom of the Bedchamber to Prince George of Denmark, 221. Vetch (Vethe), Samuel, colonel, bills of exchange drawn from New England and New York by, 377, 387, 432, 438, 455. Vezian, James, royal bounty for, 376. Viale, Marquis Benedetto, Envoy Extraordinary from the Republic of Genoa, present to, 413. Vicary, . claimant to land in Woolmer and Alice Holt Forest, 361. Vickery, William, merchant, petition of, concerning prize wines, 447. Vienna, Court of, F. Palmes sent to, 78. Vigo, English taken prisioners at, 158. Vigures, John, highway robber, reward for arrest of, 245. Villiers (Viller), , colonel, Governor of Tynemouth garrison, 244.
arrears of, 29, 404, 428.
grant of various offices, etc., at Hampton Court in trust for, 79, 89, 1767, 2534. -, Christopher, 1st Earl of Anglesey, lessee of the manor of Walton Leigh, 375. -, George, colonel, regiment of, reformed officers of, half pay for, 122. -, William, Brigadier, pension payable to his wife, 310. Vincent, , Deputy to the Paymaster of Guards and Garrisons in Spain, accounts, auditing fees, 308, 309. -, -, memorial of, 127. Vinckestyne, Herbert, lands of, in Lynn Regis, extended for debt, 83. Vinegar, Duties on. See CustomsDuties. Viner, Sir Robert, patentee of a banker's annuity, 349. 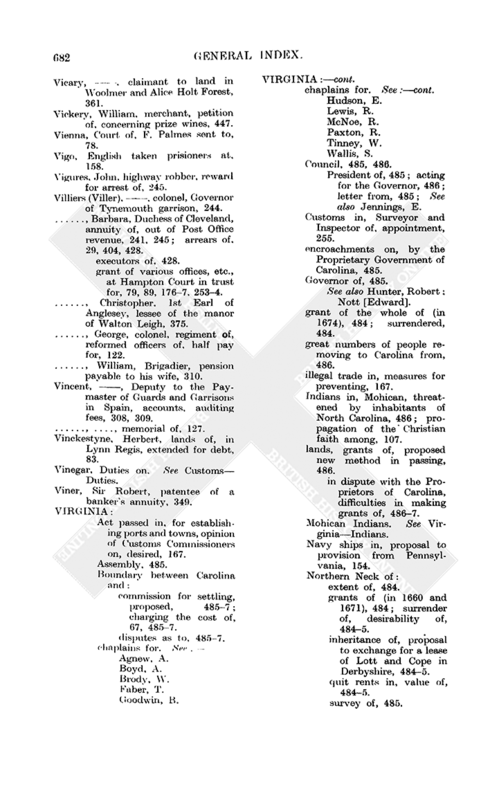 Act passed in, for establishing ports and towns, opinion of Customs Commissioners on, desired, 167.
charging the cost of, 67, 4857.
letter from, 485; See also Jennings, E.
Customs in, Surveyor and Inspector of, appointment, 255.
encroachments on, by the Proprietary Government of Carolina, 485.
great numbers of people removing to Carolina from, 486.
illegal trade in, measures for preventing, 167.
propagation of the Christian faith among, 107.
lands, grants of, proposed new method in passing, 486.
in dispute with the Proprietors of Carolina, difficulties in making grants of, 4867. Navy ships in, proposal to provision from Pennsylvania, 154.
surrender of, desirability of, 4845.
inheritance of, proposal to exchange for a lease of Lott and Cope in Derbyshire, 4845.
quit rents in, value of, 4845.
ports and towns in, establishing of. See Virginia, Act. Queen's Revenue in, 67, 485.
charging the Boundary Commission expenses on, 67, 4857.
payments out of, 106, 487. Receiver General of, 106, 487.
seizures and forfeitures in, account of, required, 488.
tobacco, Duty of 2s. per hogshead, 486.
trade, ill condition of, 483, 486.
destroyed by fire (in October, 1705), 107, 487.
rebuilding of, royal bounty for, 1067, 487. Virginia, [co. Cavan], barracks in, maintenance of, 121. Vizian, , purveyor of the Stables to William III, arrears of, 137. Wachop, Mary, pensioner on the Charity Roll of Scotland, 470. Waddell, Agnes, pensioner on the Charity Roll of Scotland, 470. Wade, , payment to, for charges of an Admiralty suit, 285. -, George, brigadier, payment to, for services and loss of baggage, etc., in Spain, 216.
tigers sent to the Queen by, 146. Wagstaffe, Benjamin, appointed tidesman in London port, 79. Waiters and waiters and searchers. See Customs. Wakeman, John, lands of, in Great Yarmouth, 237.
purchased by the Governors of Queen Anne's Bounty, 81. Waldrom, Michael, quartermaster in Brigadier Wolsey's regiment, half pay for, 121. Waldron, Henry, tidesman in London port, dismissed, 138. -, -, tidewaiter in London port, petition of, 140. Walef, Monsieur, Convention with (dated 24 Feb., 1703), 408.
regiment of dragoons of. See ArmyLow Countries, Twenty thousand men. Auditor of Crown Land Revenues. See Godolphin, S.
Judges of, salaries, 78, 218, 2823, 452. North, Excise collector. See Hunt, W.
Walker, Dr. George, family of, pension in Ireland for the support of, 357. -, Helen, pensioner on the Charity Roll of Scotland, 472. -, John, pension in Ireland for, 357. -, Jos., imprisoned for assault on a Customs officer at Liverpool, petition of, 301. -, Margaret, pensioner on the Charity Roll of Scotland, 471. -, Robert, quartermaster in Lord Charlemont's regiment, half pay for, 122. -, Thomas, housekeeper at Newmarket, salary, 279. Wallace, Katharine, pensioner on the Charity Roll of Scotland, 470. Waller, Dame Catherine, royal bounty for, 25, 249, 250. Wallington, co. Surrey, hundred of. Assessment Commissioners, process against, 394. Wallis, Dr. [John], payments to, for deciphering letters, 18990. -, Phillip, payment to, for care of a ship at Jersey, 284. -, Samuel, chaplain for Virginia, passage money for, 351. -, William, payment to, for clothing, 248. Walmer, Walmar, co. Kent, riding officers at, 332. Walpole (Walpool), Horatio, Secretary to the Ambassador Extraordinary and Plenipotentiary for the Treaty of a General Peace, equipage of, 204, 245. -, Robert, sick in the country, 452.
allowances out of deductions from pay of Forces Abroad and contingencies of Guards and Garrisons, 84.
attending the Treasury, 4, 31.
copies of Acts for, 8, 131.
letters, etc., from Holland and Flanders to, directions concerning delivery of, 44.
letters and warrants to, 11, 29, 56, 87, 93, 111, 113, 131, 133, 135, 147, 256, 257, 259, 290, 295, 346, 359, 363, 380, 401, 437, 440.
matters referred to, 26, 38, 45, 68, 126, 140, 151, 161, 165, 171, 176, 178, 201, 210, 212, 213, 230, 234, 243, 288, 316, 318, 320, 322, 326, 355, 424, 433, 435, 439, 441, 446, 452, 461, 463.
reports by, 87, 244, 256, 257, 259, 3467, 359, 3634. Treasurer of the Navy, issues to, 428, 456. Walsh, John, musical instrument maker, payment to, 24, 235. Waltham Forest, co. Essex, officers of, fees and allowances of, 54, 358. Walthorpe (Walthorp), Ann, pensioner of the Prince of Denmark, 224, 300. Walton, William, proposal of, for supplying gunpowder to the Ordnance, 465. Walton Leigh, co. Surrey, manor of, lease of, 3745.
leases of lands in, 689, 3745. Warburton, George, Deputy Postmaster in Ireland, petition of, 421. -, Jane, a Maid of Honour, annuity of, 303, 362, 391. Ward, David, major, surety for Major Tynte, Governor of Carolina, 64. -, John, M.P., letter to, mentioned, 138. -, -, merchant, petition of, concerning prize wines, 447. -, Patience, lease of tithes in Hooton Pagnell, Clayton, Frickley and Shippins, 257. Wardoack, , ensign, Army Debenture of, 356. Great, accounts, auditing fees, 309.
issue for the service of, 69, 322. Master or Keeper of, accounts, auditing fees, 309.
warrants to, 100, 139, 183, 305, 381, 386, 435, 448, 485, 488. Montagu, Ralph, Duke of Montagu. Keeper (Yeoman) of. See Davenant, G.
Page of. See Lucas, C.
-, in Scotland. See Scotland. Ware, James, Auditor General of Ireland, 436. -, Thomas, trumpeter in the Fourth Troop of Horse Guards, 128. Warren, Borlace, sheriff of co. Oxford, 245. -, William, mariner, proposal of, for improved packet boat service to New York, 475. 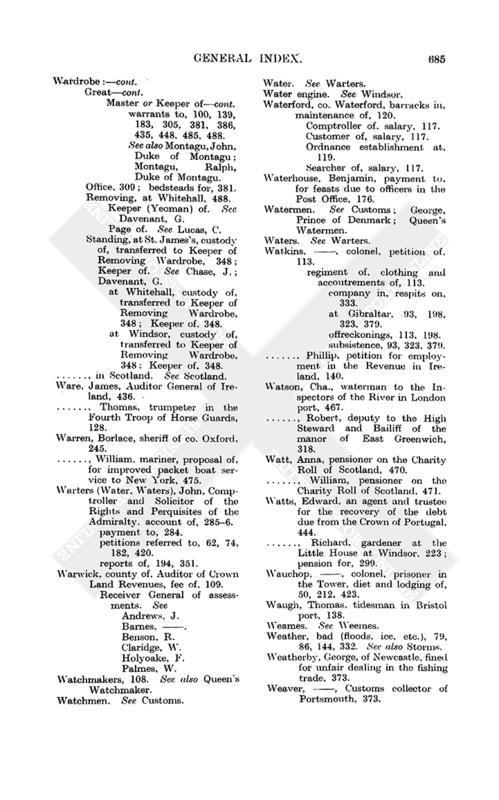 Warters (Water, Waters), John, Comptroller and Solicitor of the Rights and Perquisites of the Admiralty, account of, 2856.
petitions referred to, 62, 74, 182, 420. Warwick, county of, Auditor of Crown Land Revenues, fee of, 109. Watchmakers, 108. See also Queen's Watchmaker. Waterford, co. Waterford, barracks in, maintenance of, 120. Waterhouse, Benjamin, payment to, for feasts due to officers in the Post Office, 176. Watkins, , colonel, petition of, 113.
regiment of, clothing and accoutrements of, 113.
company in, respits on, 333.
at Gibraltar, 93, 198, 323, 379. -, Phillip, petition for employment in the Revenue in Ireland, 140. Watson, Cha., waterman to the Inspectors of the River in London port, 467. -, Robert, deputy to the High Steward and Bailiff of the manor of East Greenwich, 318. Watt, Anna, pensioner on the Charity Roll of Scotland, 470. -, William, pensioner on the Charity Roll of Scotland, 471. Watts, Edward, an agent and trustee for the recovery of the debt due from the Crown of Portugal, 444. Wauchop, , colonel, prisoner in the Tower, diet and lodging of, 50, 212, 423. Waugh, Thomas, tidesman in Bristol port, 138. Weather, bad (floods, ice, etc. ), 79, 86, 144, 332. See also Storms. Weatherby, George, of Newcastle, fined for unfair dealing in the fishing trade, 373. Weaver, , Customs collector of Portsmouth, 373. Webb, Lieutenant General, victory of, [at Wynendale], 446. -, Isaac, seaman in the packet boat Marlborough, 356. -, John, lieutenant of the Royal Regiment of Marines, royal bounty for, for extraordinary services at Gibraltar, 159. -, Joseph, huntsman to the Harriers of Prince George of Denmark, 222, 298. -, Mary, lease of a messuage belonging to Savoy Hospital, 90. -, Robert, mate to the Customs boatman at Whitstable, 467. -, Roger, Harbourer to Prince George of Denmark, 222, 299. -, St. John, captain, his company in Lord Shannon's regiment of marines, paying and clearing of, 106. -, Thomas, Receiver General of Taxes for co. Gloucester, 125. -, -, seaman in the packet boat Marlborough, 356. -, -, Second Justice of Pembroke, Carmarthen and Cardigan, salary, 283. -, -, Solicitor to Prince George of Denmark, 222, 299. Webber, Edward, payment to, for services in Ireland, 478. Webster, Sir Thomas, proposal of, concerning annuities and reversionary annuities, 28. Wedderburn, Alexander, an Excise Commissioner for Scotland, 109. Weeks, Charles, instructed in Customs business, 63. Weemes (Weames, Weems), Nicholas, pensioner on the Charity Roll of Scotland, 471. -, Robert, of Hartlepool, merchant, imprisoned for Salt Duties frauds, 124, 373. Weighers in fee. See Customs. Weights and measures. See Scotland. 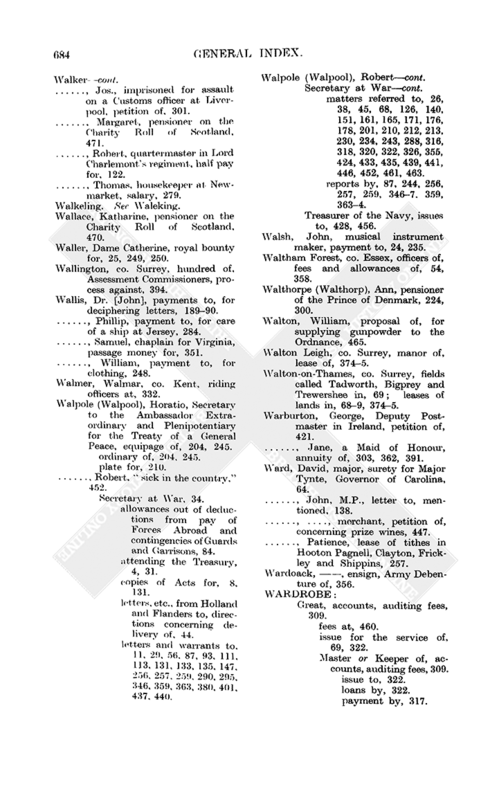 Wekett (Wecket, Weket), William, allowances for attendance and disbursements at the Treasury Office, 53, 141, 238, 383, 390, 481. Welby, Adlard, appointed a land-waiter in London port, 40. Wellington, George, tidesman at Minehead, 40. Welwood, Dr. James, a Commissioner for Sick and Wounded, 236. Wemyss, David, Earl of Wemyss (Weymss), royal bounty for, 300. Wenman, Richard, Viscount Wenman of Tuam (Lord Wenam), trial of, 226. -, William, affidavit of, concerning lands in Sherwood Forest, 273. 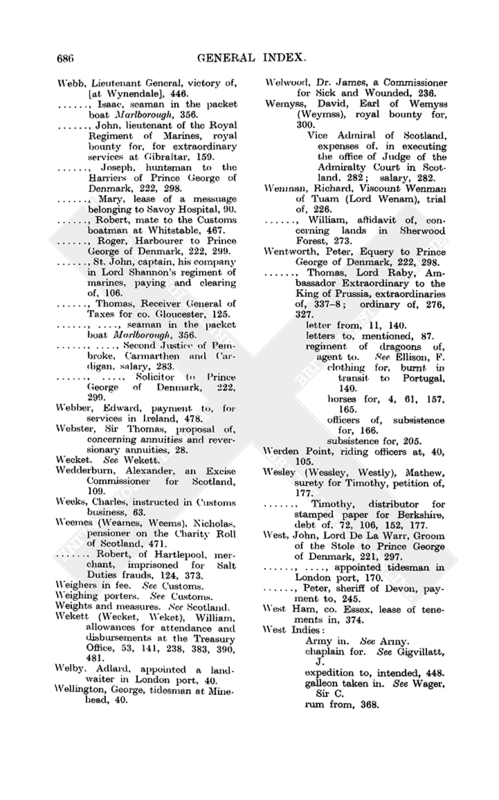 Wentworth, Peter, Equery to Prince George of Denmark, 222, 298.
regiment of dragoons of, agent to. See Ellison, F.
clothing for, burnt in transit to Portugal, 140.
horses for, 4, 61, 157, 165.
officers of, subsistence for, 166. Werden Point, riding officers at, 40, 105. Wesley (Wessley, Westly), Mathew, surety for Timothy, petition of, 177. -, Timothy, distributor for stamped paper for Berkshire, debt of, 72, 106, 152, 177. West, John, Lord De La Warr, Groom of the Stole to Prince George of Denmark, 221, 297. -, -, appointed tidesman in London port, 170. -, Peter, sheriff of Devon, payment to, 245. West Ham, co. Essex, lease of tenements in, 374.
chaplain for. See Gigvillatt, J.
galleon taken in. See Wager, Sir C.
proposal for provisioning from Pennsylvania, 154.
inspector of. See Collins, G.
Westbrooke, , Lord Admiral's suit against, 285. Westminster, co. Middlesex, 78, 150, 218, 374, 422. Abbot and Convent of, 254. Auditor of Crown Land Revenues, fee of, 109.
clocks at, keeper of, fee of, 254. Dean and Chapter of, payment to, 245. Queen's House at, Keeper of. See Incledon, J.
Receiver General of assessments. See Fazakerley, Sir W.
streets, etc., in. See London and Westminster. Westmorland, county of, Auditor of Crown Land Revenues, fee of, 109. Receiver General of assessments. See Brougham, T.
Receiver General of House Duties, 252. Westmorland, Earl of. See Fane, Thomas. Weston, Jerome, Earl of Portland, lessee of the manor of Walton Leigh, 374. -, John, Receiver General of assessments for Surrey and Southwark, 48, 394. Wetherly, Terry, Comptroller of Customs of Inverness, 163. Wexford, co. Wexford, barracks in, maintenance of, 120. Customer and Comptroller of, salaries, 117. Weyanoak Creek, as a boundary of North Carolina, 485. Weybridge, co. Surrey, lease of lands in, 68. Pley, George, senior and junior. Comptroller of. See Smith, Nathaniel. Prizes Agent at. See Bower, T.
Whale Fins, Duty on. See CustomsDuties. Whaple, Samuel, landwaiter in London port, 40. Wharton, Richard, surveyor of Berwick port, appointed landcarriageman at Newcastle, 79. -, Thomas, Earl of Wharton, and the lease to Mr. Marriot, 7, 113. Lord Lieutenant of Ireland, attending the Treasury, 3, 31.
to examine and report on pensions, 3, 123. Wheeler, Andrew, colonel, of the Second Battalion of Foot Guards, petition of, 463. -, Benjamin, tidesman at Salcombe, dismissed, 332. -, [Thomas], brigadier, commander in chief of the intended expedition, 286, 287. Secretary to, pay of, 215, 422.
regiment of, pay and subsistence of, 9, 215. 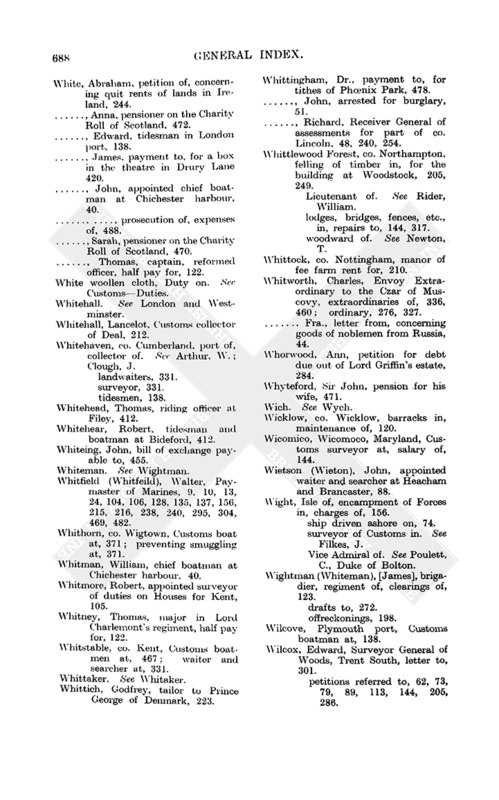 Whitaker (Whitacre, Whittaker), Charles, Chief Justice of Pembroke, Carmarthen and Cardigan, salary, 282. 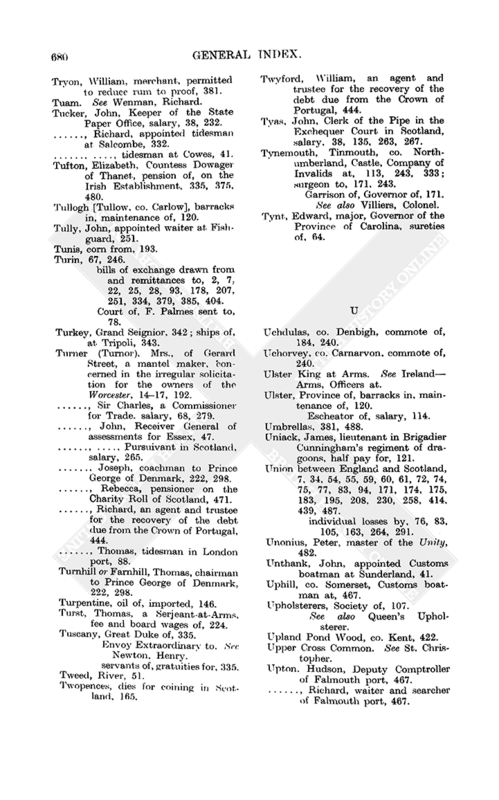 -, -, Foreign Apposer in the Exchequer Court, salary, 322. Whitby, co. York, port of, collector of. See Shipton, T.
petition and recommendation for place of, 170, 173.
waiter and searcher of, 190. White, Abraham, petition of, concerning quit rents of lands in Ireland, 244. -, Anna, pensioner on the Charity Roll of Scotland, 472. -, Edward, tidesman in London port, 138. -, James, payment to, for a box in the theatre in Drury Lane 420. -, John, appointed chief boatman at Chichester harbour, 40. -, -, prosecution of, expenses of, 488. -, Sarah, pensioner on the Charity Roll of Scotland, 470. -, Thomas, captain, reformed officer, half pay for, 122. White woollen cloth, Duty on. See CustomsDuties. Whitehall. See London and Westminster. Whitehall, Lancelot, Customs collector of Deal, 212. Whitehead, Thomas, riding officer at Filey, 412. Whitehear, Robert, tidesman and boatman at Bideford, 412. Whiteing, John, bill of exchange payable to, 455. Whitfield (Whitfeild), Walter, Paymaster of Marines, 9, 10, 13, 24, 104, 106, 128, 135, 137, 156, 215, 216, 238, 240, 295, 304, 469, 482. Whitman, William, chief boatman at Chichester harbour, 40. 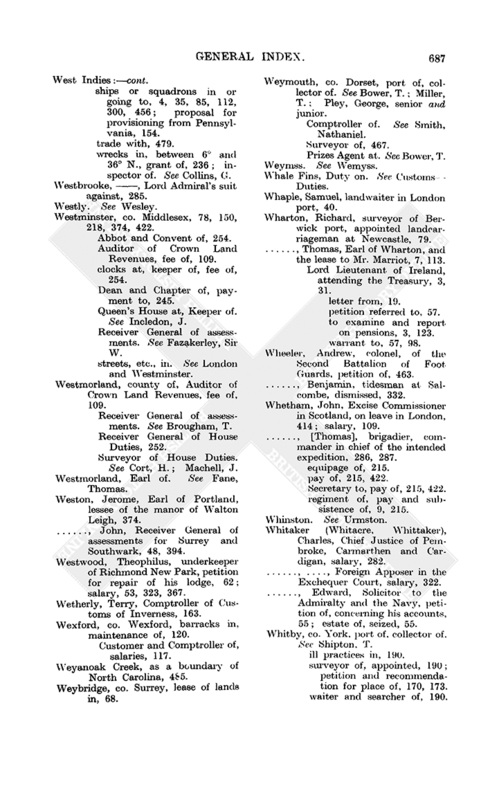 Whitmore, Robert, appointed surveyor of duties on Houses for Kent, 105. Whitney, Thomas, major in Lord Charlemont's regiment, half pay for, 122.
waiter and searcher at, 331. Whittich, Godfrey, tailor to Prince George of Denmark, 223. Whittingham, Dr., payment to, for tithes of Phnix Park, 478. -, John, arrested for burglary, 51. -, Richard, Receiver General of assessments for part of co. Lincoln, 48, 240, 254. 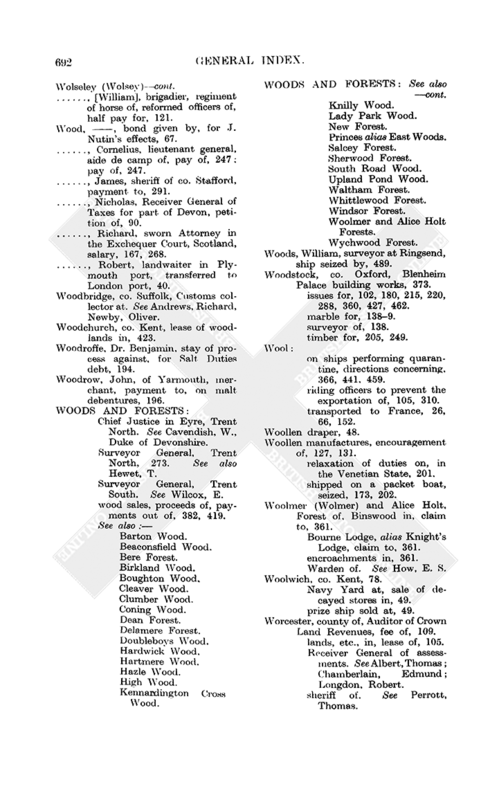 Whittlewood Forest, co. Northampton, felling of timber in, for the building at Woodstock, 205, 249. Lieutenant of. See Rider, William. lodges, bridges, fences, etc., in, repairs to, 144, 317.
woodward of. See Newton, T.
Whittock, co. Nottingham, manor of fee farm rent for, 210. -, Fra., letter from, concerning goods of noblemen from Russia, 44. Whorwood, Ann, petition for debt due out of Lord Griffin's estate, 284. Whyteford, Sir John, pension for his wife, 471. Wicklow, co. Wicklow, barracks in, maintenance of, 120. Wicomico, Wicomoco, Maryland, Customs surveyor at, salary of, 144. Wietson (Wieton), John, appointed waiter and searcher at Heacham and Brancaster, 88. Wight, Isle of, encampment of Forces in, charges of, 156.
ship driven ashore on, 74.
surveyor of Customs in. See Filkes, J. Vice Admiral of. See Poulett, C., Duke of Bolton. Wightman (Whiteman), [James], brigadier, regiment of, clearings of, 123. Wilcove, Plymouth port, Customs boatman at, 138. Wilcox, Edward, Surveyor General of Woods, Trent South, letter to, 301.
petitions referred to, 62, 73, 79, 89, 113, 144, 205, 286.
reports by, 104, 332, 3856, 465.
warrants to, 103, 235, 249, 317, 326, 332, 382, 385, 419, 465. -, Geo., petition of, for balance of sum recovered from the Governor of New York, 449. Wildt, Hiob de, accounts of, for transport of troops from Holland to Ireland, 85, 89, 97. Wilkinson, John, merchant, permitted to reduce rum to proof, 381. William III, 89, 389, 438. Apothecary to. See Chase, J. Clerk of the Woodyard to. See Perkins, M.
grants by, 62, 143, 206, 289, 318.
his share of the debt due from the Crown of Portugal, 444. Cofferer of. See Newport, Francis, Earl of Bradford. Lord Chamberlain. See Spencer, Robert, Earl of Sunderland. landing of, sums advanced by Customs collectors at, 442.
servants of, arrears due to, 81, 137, 187, 351. Stables of, purveyor of. See Vizian, . Williams, , Queen's Printer, directions to, 141, 170. -, Ann, executrix of David, petition of, 80. -, Daniel, payment to, for fees due to St. Peter's Church, Westminster, 108. -, David, Receiver General of Taxes for cos. Denbigh and Flint, accounts of, 80. -, Edward, waterman to Prince George of Denmark, 299. -, Henry, waiter at Llanstephen, 41. -, John, agent to the Queen's Printers, payment to, 274. -, Roger, footman to Prince George of Denmark, 222, 298. -, Sir Thomas, lessee of lands in Walton, 374. -, Thomas, convicted for robbery in a street near Newgate, 176. -, William, captain, the dispute between the Customs collector at Mounts Bay and, 303. -, -, payment to, for coffin, hearse, etc., 107. Williamson, Edmund, a Commissioner for stating the debts of William III, 289. -, -, a Sergeant-at-Arms, fee and board wages of, 224. -, Marion, pensioner on the Charity Roll of Scotland, 472. Willis, Henry, clerk to the Attorney General, payment to, 54. -, Thomas, order of loan assigned to, 133. Wills, , major general, equipage of, 217.
expedition commanded by, 217, 270, 293.
major of brigade of, pay of, 217. Wilson, , captain, et al., merchants, permits to reduce rum to proof, 368, 381. -, Jean, pensioner on the Charity Roll of Scotland, 470. -, John, arrested for felony and burglary, 322. -, Joshua, merchant, permit to reduce rum to proof, 381. Wiltshire, Auditor of Crown Land Revenues, fee of, 109. Receiver General of assessments. See Beaven, T.
sheriff of. See Kenton, F.
Winchester, co. Southampton, gamekeeper to Prince George of Denmark at, salary, 223, 299. Windham, Dame Ann, daughters of, 178, 458. -, Frances, daughter of Ann, pension of, 178, 458. -, Sir Francis, bart., pension of, 176, 458. -, Rachel, daughter of Ann, pension of, 178, 458. Window, William, of London, merchant, grant of lands in Kent, 305, 4223.
surety for R. Breton, collector of Dover port, 305, 422. Windows, Duties on. See Houses. Windsor, co. Berks, Castle Hill, old houses, etc., at, purchased and demolished, 313, 421. Company of Invalids at, 113. Dr. Arbuthnot's lodgings at, 231.
gardener at. See Watts, R.
keeper of. See Brown, Faith. payments to minister for, 223, 299. Queen's Garden House at, mourning for, 100.
road to, repair of, 295. School, Governors of, pension of, 224, 300. Apothecary at. See Davis, . carved work in, Gringling Gibbons' salary for the care of, 40. Chapel at, prayer books for, 230. Council Chamber, mourning for, 386. Governor and Captain of. See Fitz Roy, George, Duke of Northumberland. Housekeeper of. See Randue, . new riding from the Great Park to, 103. Painted Chamber, mourning for, 231. Plumber at. See Roberts, Joseph. Private Chapel at, mourning for, 231, 386. Queen's Apartments, mourning for, 100, 236.
royal warrants, etc., dated at, 24750, 272, 278, 282, 289, 2912, 297, 300, 303, 312, 318, 324, 334, 347, 350, 352, 357, 3657, 372, 376, 3823, 387, 390, 392, 394, 402, 405, 407, 410, 411, 491.
servants at, medicines and physic for, 420. Standing Wardrobe at. See Wardrobe. Terrace, the, purchase of ground adjoining, 421.
works at, clerk of. See Brown, James. issues for, 322, 389, 409. Paymaster of. See Roberts, W.
Yeomen of the Guard at, candlesticks for, 381. Cranbourne Chase or Park, deer in, hay for, 464. Ranger of. See Jones, Richard, Earl of Ranelagh. 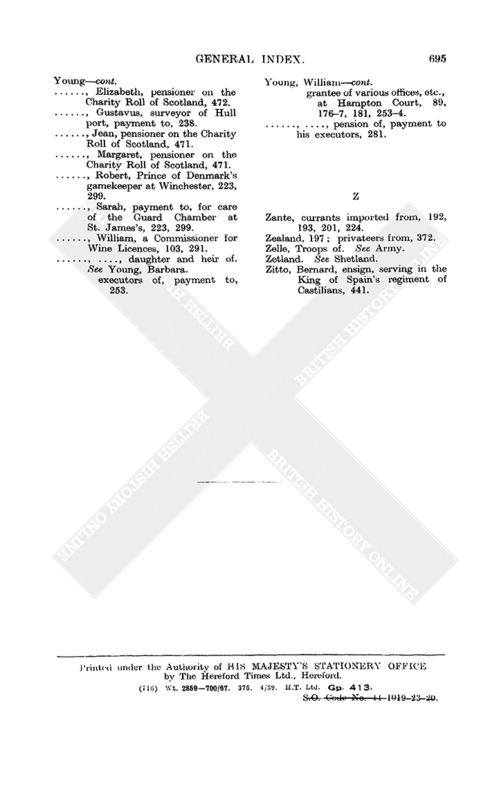 Swinley Rails, lodge called, petition for lease of, 73. Warden of. See Fitz Roy, George, Duke of Northumberland. 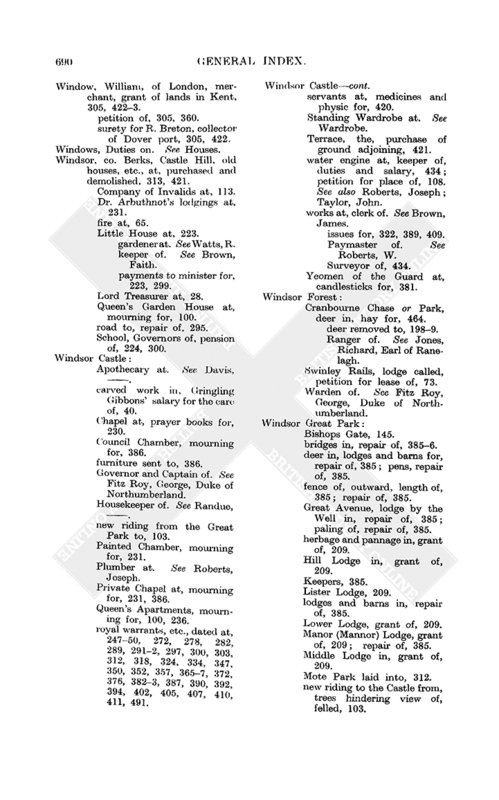 bridges in, repair of, 3856.
paling of, repair of, 385.
herbage and pannage in, grant of, 209. Hill Lodge in, grant of, 209.
lodges and barns in, repair of, 385. Lower Lodge, grant of, 209. Middle Lodge in, grant of, 209. Mote Park laid into, 312.
new riding to the Castle from, trees hindering view of, felled, 103.
new road across, payment for making, 145. Paddock Walk, grant of, 209.
pheasants in, allowance for breeding and keeping, 89, 385.
ponds in, repair of, 3856. Ranger or Keeper of, grant of office of, 209. Well. See (above) Great Avenue. works in, 12, 138, 249.
deer in, hay for, 253.
new lodge in, grant of, 209.
works in, 138, 249, 384.
laid into Windsor Great Park, 312.
manor of, debts on, 20. Windsor Herald. See Maudit, Peers. Commissioners for (W. Young, et al. ), accounts, 103, 291. 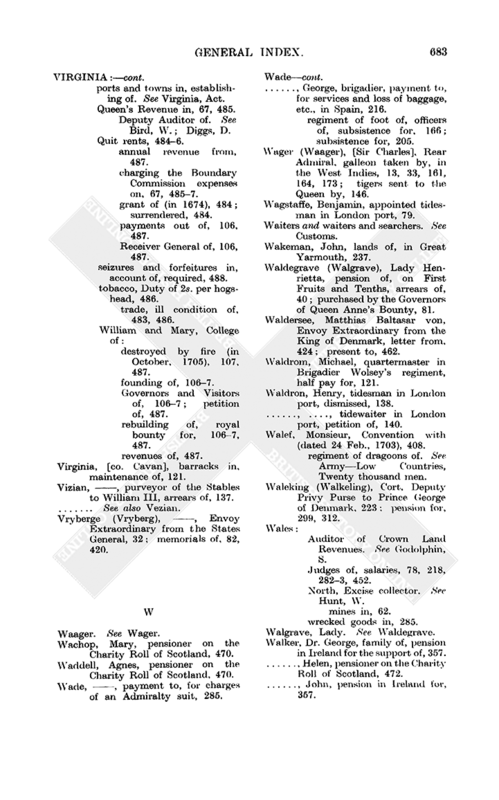 Office, incidents and salary bill, 419.
revenue from, amount of, 64.
for the City of London, bill of impost on, 140.
for the Duke of Marlborough, 90.
for the Royal Household, 12, 152, 184. Low, Duties on. See ExciseDuties. low price of, in Scotland, 252.
saved from wrecks, 82, 140, 146. Spanish, imported, 145, 2523, 381. Sweet, Duty on. See ExciseDuties. See also IrelandPrizage and Butlerage. Wingfield, Thomas, quartermaster in Brigadier Wolsey's regiment, half pay for, 121. 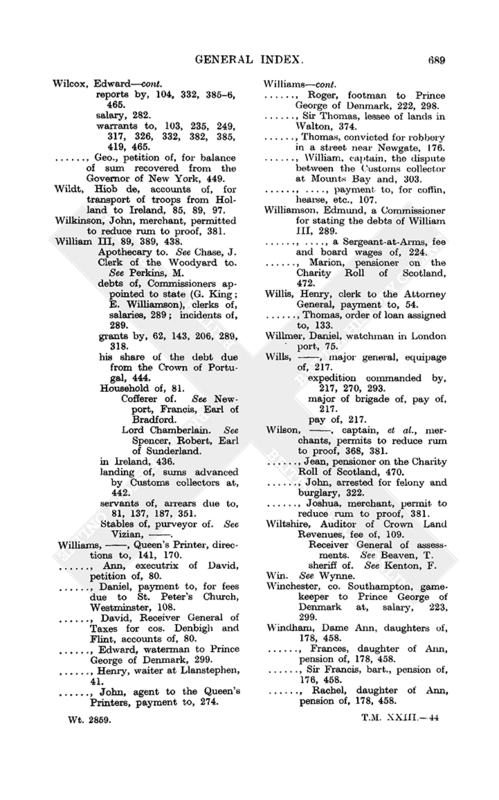 Winram, Helen, pension in Scotland for, 470. Winter, John, shipwright, Navy bills sold by, 98, 173, 179. Wise, Henry, allowance for keeping the Queen's Gardens and Plantations and in respect of St. James's Park, 40, 129, 249, 386.
letter to, on repairs at Hampton Court, 301.
payments for, 12, 145, 249, 384. Wiseman, Samuel, Comptroller of Malt Lottery Tickets, salary, 315. Wishart, Bettie, pensioner on the Charity Roll of Scotland, 470. -, Helen, pension in Scotland for, 473. Witchford, Wychford, Isle of Ely, hundred of, inhabitants of, fine set on, for a pretended robbery, 107. Treasurer and Chief Constable of. See Peacock, R.
-, Hunt, colonel, charges of, in serving in a Catalan regiment, 293. Witicki, Godfrey, pensioner of Prince George of Denmark, 300.
levy money for, 188, 212, 225. Wivenhoe, co. Essex, Customs smack at, commander and mate of, 467. Wolseley (Wolsey), Richard, captain, petition for half pay in Ireland, 332. -, [William], brigadier, regiment of horse of, reformed officers of, half pay for, 121. Wood, , bond given by, for J. Nutin's effects, 67. -, James, sheriff of co. Stafford, payment to, 291. -, Nicholas, Receiver General of Taxes for part of Devon, petition of, 90. -, Richard, sworn Attorney in the Exchequer Court, Scotland, salary, 167, 268. -, Robert, landwaiter in Plymouth port, transferred to London port, 40. Woodbridge, co. Suffolk, Customs collector at. See Andrews, Richard, Newby, Oliver. Woodchurch, co. Kent, lease of woodlands in, 423. Woodroffe, Dr. Benjamin, stay of process against, for Salt Duties debt, 194. Woodrow, John, of Yarmouth, merchant, payment to, on malt debentures, 196. Chief Justice in Eyre, Trent North. See Cavendish, W., Duke of Devonshire. Surveyor General, Trent North, 273. See also Hewet, T.
Surveyor General, Trent South. See Wilcox, E.
wood sales, proceeds of, payments out of, 382, 419. Woolmer and Alice Holt Forests. Woods, William, surveyor at Ringsend, ship seized by, 489. Woodstock, co. Oxford, Blenheim Palace building works, 373.
issues for, 102, 180, 215, 220, 288, 360, 427, 462.
on ships performing quarantine, directions concerning, 366, 441, 459.
riding officers to prevent the exportation of, 105, 310.
transported to France, 26, 66, 152. Woollen manufactures, encouragement of, 127, 131.
relaxation of duties on, in the Venetian State, 201.
shipped on a packet boat, seized, 173, 202. Woolmer (Wolmer) and Alice Holt, Forest of, Binswood in, claim to, 361. Bourne Lodge, alias Knight's Lodge, claim to, 361. Warden of. See How, E. S.
Navy Yard at, sale of decayed stores in, 49.
prize ship sold at, 49. Worcester, county of, Auditor of Crown Land Revenues, fee of, 109.
lands, etc., in, lease of, 105.
sheriff of. See Perrott, Thomas. 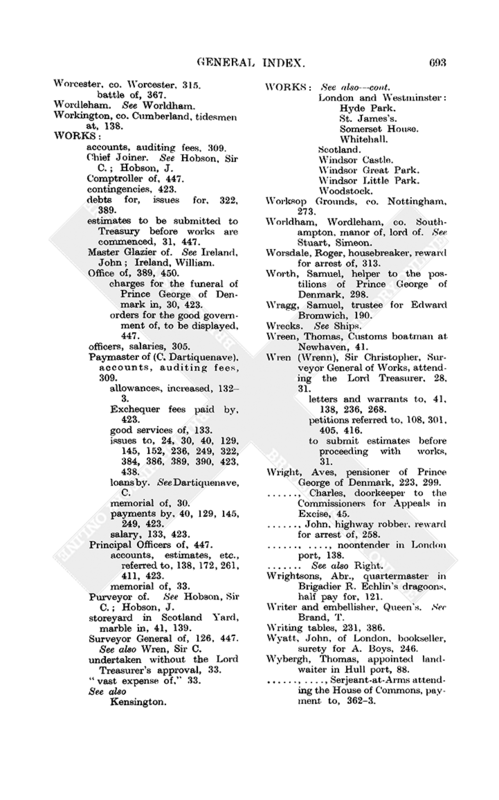 Workington, co. Cumberland, tidesmen at, 138.
debts for, issues for, 322, 389.
estimates to be submitted to Treasury before works are commenced, 31, 447.
charges for the funeral of Prince George of Denmark in, 30, 423.
orders for the good government of, to be displayed, 447. Paymaster of (C. Dartiquenave), accounts, auditing fees, 309. Exchequer fees paid by, 423.
issues to, 24, 30, 40, 129, 145, 152, 236, 249, 322, 384, 386, 389, 390, 423, 438.
loans by. See Dartiquenave, C.
payments by, 40, 129, 145, 249, 423.
accounts, estimates, etc., referred to, 138, 172, 261, 411, 423.
storeyard in Scotland Yard, marble in, 41, 139. Surveyor General of, 126, 447. See also Wren, Sir C.
undertaken without the Lord Treasurer's approval, 33. London and Westminster: Hyde Park. Worksop Grounds, co. Nottingham, 273. Worldham, Wordleham, co. Southampton, manor of, lord of. See Stuart, Simeon. Worsdale, Roger, housebreaker, reward for arrest of, 313. Worth, Samuel, helper to the postilions of Prince George of Denmark, 298. Wragg, Samuel, trustee for Edward Bromwich, 190. Wreen, Thomas, Customs boatman at Newhaven, 41. Wren (Wrenn), Sir Christopher, Surveyor General of Works, attending the Lord Treasurer, 28, 31.
letters and warrants to, 41, 138, 236, 268.
petitions referred to, 108, 301, 405, 416.
to submit estimates before proceeding with works, 31. Wright, Aves, pensioner of Prince George of Denmark, 223, 299. -, Charles, doorkeeper to the Commissioners for Appeals in Excise, 45. -, John, highway robber, reward for arrest of, 258. -, -, noontender in London port, 138. Wrightsons, Abr., quartermaster in Brigadier R. Echlin's dragoons, half pay for, 121. Writer and embellisher, Queen's. See Brand, T.
Wyatt, John, of London, bookseller, surety for A. Boys, 246. Wybergh, Thomas, appointed landwaiter in Hull port, 88. -, -, Serjeant-at-Arms attending the House of Commons, payment to, 3623. Wychwood Forest, co. Oxford, coppice woods, etc., in, lease of, 445. Wye, co. Kent, woodlands in, lease of, 423. Wye, William, fined for conspiring a prosecution in the Isle of Ely, 107. Wylie, Henry, Comptroller of Borrowstounness, 451. 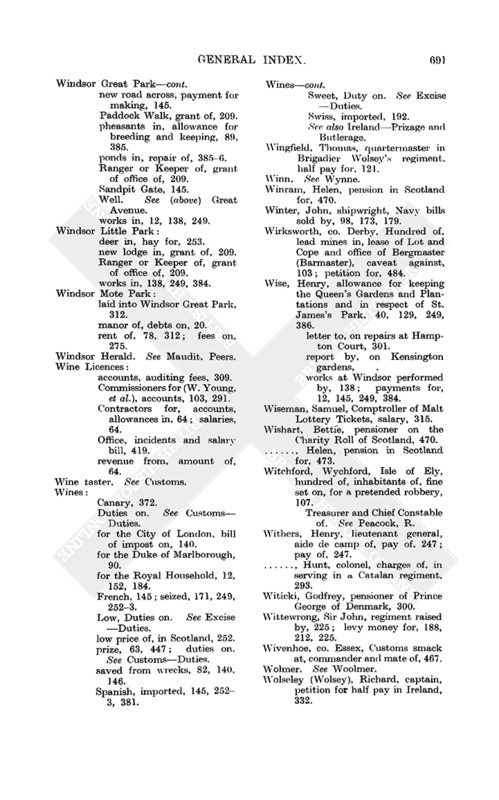 Wynne (Wyn), , colonel or brigadier, regiment of, embarkation charges in Ireland for, 479.
transportation from Ireland to England, charges of, 234. -, John, concerned in the irregular solicitation for owners of the Worcester, 13, 1417. Wytheridge, Edward, an agent and trustee for the recovery of the debt due from the Crown of Portugal, 444. Wyvill, Ann, a Maid of Honour, salary, 52, 391. -, Francis, Receiver General of Taxes for cos. York, Durham and Northumberland, 48, 427. Yaddlethorpe, Yadlethorpe, co. Lincoln, lease of lands, etc., in, 431. Yarmouth or Great Yarmouth, co. Norfolk, 196.
house in, seized for debt, 152, 237. Kingston Rowe, alias Old Broadrowe in, 237.
owners, adventurers and fishermen of, payments to, for Excise of strong beer for the North Sea and Herring Fishery, 39, 465.
collector of. See Potkins, H.
Customs smack in, mate of, 467. Yates, John, prisoner in the Fleet, release of, 194, 240. -, Nicholas, heirs of, pension of, 181, 358, 458. Yelverton, Susanna, a Maid of Honour, salary, 474. Yeomans, John, Lieutenant Governor of Antigua, allowance, 60, 151, 253, 491. Yeomen of the Guard, candlesticks for, 381. Yetts, James, Trumpeter in Scotland, salary, 265. York, county of, Auditor of Crown Land Revenues, fee of. See Jett, T.
East Riding of, distributor of stamped paper for. See Claver J.
horse race in, gifts of gold plate from the Queen for, 246, 386. Receiver General of assessments. See Wyvill, F.
Receiver General of duties on Houses, 71.
sheriff of. See Iveson, H.
York Herald. See Cromp, L.
Youghal, Yaughall, Youghall, co. Cork, barracks in, maintenance of, 120. Customer, comptroller and searcher of, salaries, 117.
appointed waiter and searcher at Whitstable, 331. -, Elizabeth, pensioner on the Charity Roll of Scotland, 472. -, Gustavus, surveyor of Hull port, payment to, 238. -, Jean, pensioner on the Charity Roll of Scotland, 471. -, Robert, Prince of Denmark's gamekeeper at Winchester, 223, 299. -, Sarah, payment to, for care of the Guard Chamber at St. James's, 223, 299. -, William, a Commissioner for Wine Licences, 103, 291. -, -, daughter and heir of. See Young, Barbara. executors of, payment to, 253.
grantee of various offices, etc., at Hampton Court, 89, 1767, 181, 2534. -, -, pension of, payment to his executors, 281. Zante, currants imported from, 192, 193, 201, 224. Zelle, Troops of. See Army. Zitto, Bernard, ensign, serving in the King of Spain's regiment of Castilians, 441.